That is according to a study of the small, ancient and hardy plants - carried out over more than a decade. What plants grow in the frozen, Antarctic desert? "But we were really surprised when we saw how fast it was changing," Prof Robinson said. "After a pilot study in 2000, we set up monitoring in 2003. When we returned in 2008, all these green moss beds had turned dark red, indicating they were severely stressed. It was a dramatic change. "They change from green to red to grey if they get really stressed. "The red pigments are the sunscreen and drought stress protective pigments they produce to protect themselves - antioxidant and UV screening compounds. "Grey means they are dying." Image caption Stressed Antarctic mosses turn from green to red as they produce compounds to protect themselves. What is stressing and killing these mosses? The scientists discovered evidence of a drying climate affecting the plants. When their study started, the moss beds were dominated by a species called Schistidium antarctici, which can survive long periods under water. By 2013, many of the beds the team studied were being encroached by two other moss species that thrive in drier conditions and are less tolerant to being submerged. "The ozone hole has pulled the polar jet stream further south, increasing its strength," explained Prof Robinson. "These winds isolate Antarctica and help to keep most of it cold as the rest of the world warms." 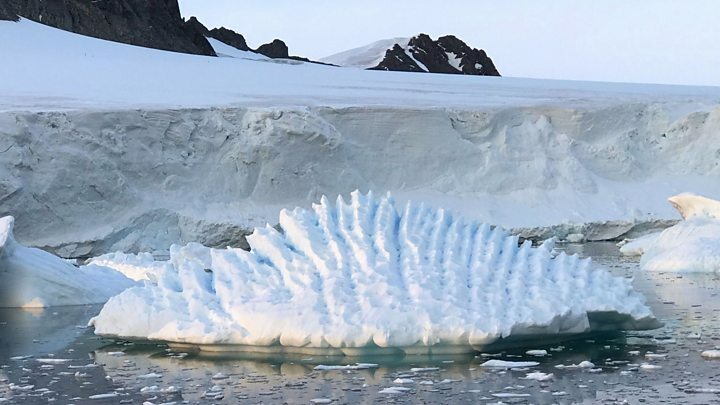 The researchers say this is the first study to show that the plants in East Antarctica are being affected by climate change and ozone depletion. 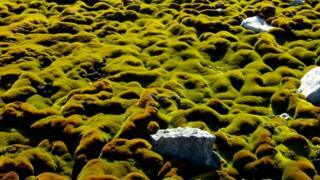 Antarctic mosses, the scientists point out, are the only plants that can survive in East Antarctica. "We like to think of them as miniature, old growth forests," said Prof Robinson. Her co-author, Dr Melinda Waterman explained that by dating the mosses, the researchers could tell "they have been growing here for hundreds of years". "As they grow, the mosses preserve a record of how dry or wet the environment is along their shoots - preserving a record of Antarctic coastal climate over the centuries," she explained. Prof Robinson added: "[They might be only] 4-14 cm tall, but [the moss beds] are home to tiny animals and fungi and lichens and algal cells - think of them as a forest and at least 40% of it is suffering drought. "The mosses are our sentinel for the whole ecosystem."